Want to buy some stuff? Sure you do! Welcome to the tekitsuneARTstore. Here is where you can find all sorts of stuff, from tees and hoodies to prints, original art and swag. Heck, you can even get our comic books. So, go forth! Buy! WIN! T-shirts, t-shirts and more t-shirts. This is the place to find our best tees in wide varieties. Wear us today! And tomorrow. Looking for an original, one-of-a-kind piece? Nothing replicated here. Sketchcovers, original art and more! High quality is the name of the game with Society6. Tees, prints, phone covers and more! Brand specific stuff will be here. Looking for some Foxtails, Inc. ware? Look no further. Curious about some of the comicstuffs we have available for print or digital? Check out the Atomicfoxtail Studios page on IndyPlanet! This is the first piece that I’d ever done in Copics. 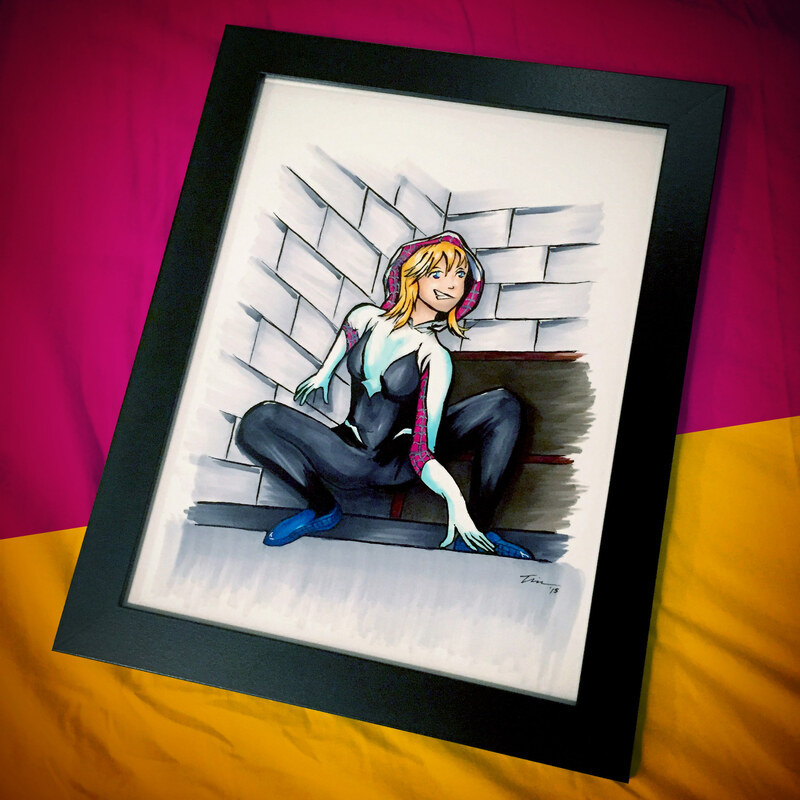 It’s the artwork from my Spider-Gwen sketchcover that I did for Long Beach Comic Con. This was colored on Day One of the con, live on the show floor from my Artist Alley booth.